WILLIS O'BRIEN, RAY HARRYHAUSEN, GEORGE PAL, ROGER CORMAN CREATING DINOSAURS ON THE MOTION PICTURE SCREEN. When luring an audience into a movie theater you need a great movie title and a even greater poster to catch their eyes. Such were the operating concepts of James H, Nicholson and his number one director Roger Corman at American International Pictures. "THE SAGA OF THE VIKING WOMEN AND THEIR VOYAGE TO THE WATERS OF THE GREAT SEA SERPENT"
it was shorten to "Viking Women and the Sea Serpent" for those theater marquees and to take up less space for tag lines on the poster as seen below. I was 11 years old in 1957 when the Los Angeles Newspaper Ad below came out. This Motion Picture Advertisement also illustrates a lost art in movie publicity as compared to today and the world of 'Smart" phones. Based upon the ad I might have first seen Roger Corman's picture at the "Sepulveda Drive-In" theater. The Drive-in was located two blocks west of my house in Van Nuys, California and climbing on the house's roof. I used to clearly watch some of the movies shown on the Sepulveda Drive-In's screen without sound and that may have been how I first viewed it 58 years ago. I really don't remember the specifics. The plot for "The Saga of the Viking Women and Their Voyage to the Waters of the Great Sea Serpent". There actually was a plot, but not much of one. It told of a group of Viking Housewives going on a search for their missing husbands. They had left on a typical Hollywood Viking drinking and pillaging binge, but hadn't return. As the above still illustrates the actual sea serpent wasn't as good looking as the movie's poster's image. However, had the studio used a photo instead of a an imaginative drawing. No adult would have paid the 75 cent admission, or if at the Sepulveda Drive-in. The one dollar "Special Admission Price" for an entire car load including those hidden in the trunk as most of us kids did. The following link is to an episode of "Mystery Science Theater 3000". Where the gang give this Roger Corman epic its just deserts. So what is a Sea Serpent? Those who sail up along the coast of Norway to trade or to fish, all tell the remarkable story of how a serpent of fearsome size, 200 feet long and 20 feet wide, resides in rifts and caves outside Bergen. On bright summer nights this serpent leaves the caves to eat calves, lambs and pigs, or it fares out to the sea and feeds on sea nettles, crabs and similar marine animals. It has ell-long hair hanging from its neck, sharp black scales and flaming red eyes. It attacks vessels, grabs and swallows people, as it lifts itself up like a column from the water. Today "modern thinking" scholars attempt to tell us that those Sea Serpent sightings of the past were probably only sightings of the "Oarfish" as seen in these two pictures. Another group of "knowledgeable" scholars choose the "Frilled Shark" as the "real" Sea Serpent of old, The shark does resemble a Hollywood Sea Serpent in looks, but I cannot envision one being large enough to swallow people "as it lifts itself up like a column from the water". Personally I prefer the Roger Corman created Sea Serpent to an "Oarfish", or a "Filled Shark". The program I watched on KTLA-TV along with thousands of other three year old" boomer" kids in 1949 was "Time for Beany". The next major character from Bob Clampett was Beany's Uncle "Captain Horatio K. (for Kermit) Huff'n'puff". What two future puppet characters in children's programming were created from Beany's Uncle's name as a tribute to Bob Clampett ? Then there was the third major character and my first sea serpent "Cecil the Sea Sick Sea Serpent". Cecil claimed to be 300 years old and 35 feet 3 inches tall. You would feel his wrath, such as it was, if you forget the 3 inches of his height. Cecil was "Green" according to Bob Clampett, because he came from the sea and the color seemed to fit. As a result of this choice by Clampett all Sea Serpents were seen as being "Green". Along with any other sea monsters during the 1950's. Cecil again illustrated the power of the new medium "Television". As a result, believe it or not, "Cecil" is the reason Godzilla on the posters for the 1956 black and white motion picture "Godzilla, King of the Monsters" is "Green".Starting a controversy over his color that still goes on The earlier 1955 movie poster for. "The Phantom from 10,000 Leagues" shows that sea monster in a "Dark Green". You can still tell that "Green" was the color used for Ray Harryhausen's Rhedosaurus in 1953's "The Beast from 20,000 Fathoms". While there is no question as to its color for "The Giant Behemoth" as this original 1959 lobby card clearly shows. In fact look at most "Fantasy" sea creatures on 1950's movie posters and they always seem to have been painted in some shade of "Green". Here is a link to a video of President Harry Truman, Bob Clampett style, and Cecil doing a musical number. From 1959 through 1962 there was a cartoon version of "Time for Beany" with the title of "Beany and Cecil". This still shows Beany, his Uncle, Cecil and "Dishonest John (DJ)". I mentioned two theories about what might really have been a Sea Serpent. However, another group of researchers believe that the Sea Serpents of mythology might also have been nothing more than a tentacle of a Giant Squid breaking the water's surface for a moment. It would have had the appearance of a long necked sea animal to anyone unfamiliar with the Giant Squid. Here's a link about a Giant Squid that washed up on a New Zealand beach. It should be also noted that Jules Verne described the Nautilus as appearing to members of ship crews about to be destroyed as looking like a giant sea serpent. The still on the left from the Disney movie also gives that impression. The idea of a submarine being mistaken for a sea serpent was used in producer George Pal's 1961 motion picture "Atlantis: The Lost Continent". Pal uses the idea on the character of a Greek fisherman who was tricked into helping the Princess of Atlantis go home. The scenes of the submarine approaching the fishing boat are really done very well and the design helps with the sea serpent illusion. However, only about two to three minutes of the entire motion picture shows this great looking undersea craft from the outside. Here's a link to that entire motion picture, if you're interested. The effects are dated and the rubber monster heads look cheesy, but the film isn't as bad as its reputation. Unfortunately these are very faded stills of the submarine, but you can still make out the sea serpent look of it. A sea serpent can also become a God as in Toho studio's 1963 "Kaitei Gunkan (Undersea Warship aka: Atragon)". Here we have another lost continent, but not in the Atlantic, but the Pacific in MU. Their Queen wants to retake the surface world and one of her weapons is their God "Manda". Having been made in Japan Manda takes on the physical appearance more of a typical Asian dragon than what many non-Asians would consider a sea serpent as shown in the Roger Corman's motion picture of 6 years earlier. Is it a Plesiosaur, or just your common variety sea serpent? On the other hand does he, she, or it actually exist? According to a 7th century text written by the Abbot of Iona Abbey. The future Saint Columbia and a group of Pics were attacked by a sea beast in 555 A,D., but the future Saint was able to drive it off. After that event the Pics found religion and Saint Columbia became their patron Saint. This happened at a Lake in the Scottish Highlands called Loch Ness. There are two films and a television episode featuring "Nessie" that I really enjoy. All three are not horror films as many pictures featuring "The Loch Ness Monster" seem to now be. The first film was directed by Billy Wilder and released in 1970 as "The Private Lives of Sherlock Holmes". Holmes and his faithful Watson in one of the two stories within the motion picture are introduced by Mrs. Hudson to a distraught wife. She has sought "the World's first Consulting Detective" for his assistance in searching for her missing husband. Tracking down the husband leads Holmes back to his own brother Mycroft and a top secret British project. In reality the sightings in Loch Ness of a monster turn out to be a submarine designed by the ladies husband and disguised to confuse the German agents that are after its plans. Here's a shot of the craft in daylight and it is very comical looking in a close-up rather than terrifying. I found the following article on the web posted by "Glasgow Boy" on February 1, 2012, His blog article is about new sightings by individuals who believe they seen the real "Nessie" at Loch Ness, but it turns out to be the submarine from "The Private Lives of Sherlock Holmes". For those lovers of Sherlock Homes, or "Nessie". This link takes you to the complete Billy Wilder motion picture as released. From what I have read there were several severe cuts made by the studio. Then there was the bored newspaper man sitting in a small Arizona towns newspaper office. Where according to him no news happened, or so it seemed except for local gossip, births and deaths. So Charles G, Finney passed his time writing and the result was published in 1935 as "The Circus of Dr. Lao", It would take 29 years after that first publication until George Pal turned Finney's novel into the very entertaining "The 7 Faces of Dr. Lao" starring actor Tony Randall as all seven faces. Here are two scenes from this 1964 Honorary Oscar winner for Make-Up with Randall as Dr. Lao and Medusa. The 3,000 year old Dr. Lao rides into the small semi-Western down of Abalone, Arizona on a jackass that is carrying the doctor and seemingly nothing else. Yet he is able to set up a large circus tent, wooden bleachers, a ticket booth and other related items without ever getting anything from another source. There is also a side show tent full of attractions which are not the usual kind. Each affects a person in Abalone bringing out their darkest fears, fantasies and hidden desires and secrets and somehow these attractions resemble the doctor. When Dr. Lao leaves on the same jackass at the end of the movie. He once more appears to have nothing other than himself. However, has also made the citizens of Abalone, Arizona better than they were before he arrived. In Dr. Lao's circus tent is a small bowl with what appears to be a small fish, but the warning sign reads "Loch Ness Monster". Dr. Lao has warned everyone not to remove the fish from the water, but the bowl gets turned over and that little fish starts growing at an amazing rate into the full sized Loch Ness Monster. "Nessie" is finally stopped when it starts to rain. The monster shrinks back to its original tiny size and Dr. Lao returns it to the fishbowl. On August 30, 1975 the BBC series "Dr. Who" got into the act when the Fourth Doctor played by Tom Baker, Sara Jane Smith played by Elisabeth Sladen, Harry Sullivan played by Ian Marter and of course Brigadier Lethbridge-Stewart played by Nicholas Courtney met the Loch Ness Monster. Discovering the facts that "Nessie" was controlled by an Alien race called "The Zygons" and was really a Cyborg. His name was Willis O'Brien and he brought to me and others some great stop motion moments on motion picture film. In 1925 the first and by far the best version of Sir Arthur Conan Doyle's "The Lost World" was released by First National Pictures. I saw the 55 minute Kodascope 16 mm cut at "The Silent Movie Theater" on Fairfax Boulevard in Los Angeles. For those who have seen William Castle's 1959 motion picture "The Tingler".who hasn't. it is "The Silent Movie Theater" where the parasite gets loose in the audience and those first watching the movie feel Castle's gimmick "Percepto" as I did. The Kodascope version of the 1925 "The Lost World" was the only known cut left of the picture and O'Brien's work for decades. Slowly the original film is being restored to its original length of 106 minutes as more footage is found across the globe. I have the 93 minute 1992 restoration. For those interested in the history of the film's restorations and releases. This link to the website "Silent Era" is very informative. Here is a photo of Willis O'Brien working on the motion picture. That still is a part of a few minutes of footage showing Willis O'Brien creating "The Lost World" and is found of the 1992 restoration cut. The silent movie tells of an expedition to the upper reaches of the Amazon to confirm the stories of living dinosaurs by Professor George Edward Challenger. The 1925 motion picture is film to show a dinosaur turned loose on a major modern city. As a Brontosaurus escapes and goes on a rampage through London. Parts of this sequence below are still missing and others like myself hope they will turn up. Here a few other shots from this masterpiece. In 1960 Irwin Allen produced the first remake of "The Lost World" and the less said about it the better. Unless you like actors in the Amazon jungle that don't sweat, or have their hair messed up. Along with a French Poodle with died pink fur barking at a lizard that was suppose to be a dinosaur. Staying with "Obie" as his friends knew Willis O'Brien. He would team up with producer/adventurer Merian C. Cooper for Four motion pictures. The first two were released in 1933 for RKO Studios and are of course "King Kong" and its sequel "The Son of Kong". Little need be mentioned of these two motion pictures. The First is a motion picture icon and the Second a sort of children's tale in which the hero sadly dies to give the viewer a semi-Happy Ending including the redemption of Carl Denham. Below is the skeleton armature of the Brontosaurus created by Marcel Delgado for "King Kong" and brought to life by Willis O'Brien. Here's the skeleton armature created by Delgado and animated by Willis O'Brien of "Kong the Eighth Wonder of the World". It was also used for the 1949 "Mighty Joe Young". Below are some classic scenes from both motion pictures. The third shot is the cover of a "Mountain Films" release in Super 8 mm of "King Kong". The company was located in England and like "Castle Films" in the United States released cut down versions of motion pictures for home use. Apparently "King Kong" was a Super 8 mm Sound release of the complete motion picture. "Mountain Films" made and sold these films from 1967 into the 1980's. At which time the company went modern and switched to British video releases usually on the Japanese BETA system. In 1935 Merian C, Cooper planned a technicolor production of "The Last Days of Pompeii" with special effects by Willis O'Brien. RKO decided prior to the start of production to cut the budget and the motion picture had to be filmed in black and white. According to Ray Harryhausen in his book "A Century of Stop Motion Animation". O'Brien had planned a sequence were gladiators fought over a large pool in an arena. The fight was on a bridge over the pool while under it prehistoric size swordfish swim adding another element to their competition. The sequence never made it off the drawing boards after the budget cuts. Here are some stills from the motion picture starring Preston Foster and a very young Basil Rathbone as Pontius Pilate. The movie is very good, but it is also Cooper's answer to the religious films being turned out by Cecil B. DeMille. All the model sets and for its time the spectacular destruction of Pompeii were done by Willis O'Brien. Here is a link to a portion of the Vesuvius erupting sequence from Merian C. Cooper's "The Last Days of Pompeii". However, somebody removed the dialogue and the actual sound and just added music. The sequence now plays like a silent movie, but the work of Willis O'Brien stands out. One can only wish RKO hadn't cut the budget and the movie had been shot in technicolor and O'Brien's Swordfish sequence remained. In 1949 O'Brien and his apprentice a World War 2 Army Veteran named Ray Harryhausen along with Marcel Delgado made the motion picture "Mighty Joe Young". The picture was produced by the team of Merian C. Cooper and John Ford and earned Willis O'Brien his only Oscar for Special Visual Effects. Moving forward to 1956. In May of that year Irwin Allen released "The Animal World". This motion picture made for Warner Brothers was designed to compete with Walt Disney's live action adventure films such as "The Vanishing Prairie" and "The Living Desert". You will not be able to find this movie as each individual segment was copyrighted by the photographer, or naturalist that shot it. Then each of these copyrighted pieces were combined in order of the script to tell the story of the development of animal life on Earth. Even today it would be too costly for even a studio like Warner Brothers to release a remastered print due to all of those copyrights presuming a 35 mm print in a condition to be remastered could be located. I have in my Ray Harryhausen film collection a DVD copy somebody made of a 16 mm print of "The Animal World" with extremely faded color. These 16 mm prints were used by School Science Classes in the late 1950's and early 1960's across the country. Actually there is one segment available that Warner Brothers has complete ownership of and it was created by the team of Willis O'Brien and Ray Harryhausen. The segment deals with one of their favorite subjects dinosaurs. In fact all the advertising for the motion picture and the movies different posters played up that approximately 10 minutes of the 82 minute running time for this nature film. Thereby, misleading young 9 year old kids like myself into thinking it was actually a dinosaur movie. Here is a link to the O'Brien and Harryhausen dinosaur segment. The stop motion is not the quality of their earlier work, or Ray's later. Harryhausen talked Irwin Allen out of doing the sequence with static dioramas featuring plastic dinosaurs, but Allen still didn't increase the budget. "The Animal World" was the first of two meetings Willis O'Brien had with Irwin Allen. The second was over his 1960 version of "The Lost World". Allen invited O'Brien to visit him about working on the remake of his 1925 film. According to Ray Harryhausen Willis O'Brien brought a completed script and designs for several prehistoric creatures to Irwin Allen's office. Once O'Brien signed on to the project. Allen had gotten what he wanted the stop motion animator's name associated with his film. The dinosaurs became real lizards and Iguana's with fake fins added to their bodies to keep costs down. Willis O'Brien was listed as the FOURTH Technician in the credits, but Irwin Allen's ruse worked as people "assumed" O'Brien would be using stop motion animation on the picture. I was still 9 when in August of 1956 "The Beast of Hollow Mountain" was released. Outside of the theater where I saw the movie was a life size statue of the dinosaur. The motion picture starred televisions "Wild Bill Hickok" Guy Madison. Patricia Medina and Carlos Rivas. It was a United States/Mexico co-production. The story and screen play are about an American rancher in Mexico. His cattle begin to go missing and some are found mutilated which he blames on a rival large Mexican Rancher who wants him out of the country, because Americans don't belong, Original 1956 credits for the motion picture state the screenplay was written by "El Toro Estrella". The motion picture was produced by Lebanese/American Edward Nassour and his brother William. The screenplay was based upon the unfinished sketches by Willis O'Brien for "The Valley of Mist". A story about modern cowboys and a living dinosaur named Gwangi. O'Brien was to have originally created the stop motion animation and other effects, but for some reason he was replaced. After being informed by Edward Nassour that he was not to work on the special effects. O'Brien removed his name from the screenplay credit and used the pseudonym of "El Toro Estrella". In later releases of the picture the credits now state the story was from an idea by Willis O'Brien. Then, in 1955, he wrote a story with Darlyne called The Beast of Hollow Mountain which was again bought by the Nassour Brothers. It was eventually made into a Cinemascope film, but without Obie's involvment. This hurt Obie a great deal and the producers decision not to let him work on the effects resulted in a poor muddled picture. The models were crudely made (even though they used Marcel Delgado's Gwangi armature) and the animation was certainly substandard. This is a link to the ten minute final sequence of "The Beast of Hollow Mountain". Which is actually the total time we ever see the dinosaur. Yes by today's standards the animation is substandard as Ray wrote, but to a 9 year old boy in 1956 the movie was thrilling. As a tribute to his mentor Willis "Obie" O'Brien. Ray Harryhausen in 1969 made the stop motion animated picture "The Valley of Gwangi". The story was adapted also from O'Brien's "The Valley of Mist" and keeps some of the basic plot lines intact. Once more we are dealing with cowboys, but instead of a dinosaur killing the cattle on a ranch. These cowboys are part of a Wild West Show and will end up in a valley filled with living prehistoric animals. Carlos Rivas was back working on another Willis O'Brien motion picture co-starring Richard Denning. This time the stop motion effects were by O'Brien, but the title of the film actually ended up with a dual purpose not planned when production began. This 1957 United States/Mexico science fiction thriller was "The Black Scorpion". The story about an earthquake in Mexico releasing prehistoric scorpions is very good and so is O'Brien's stop motion animation as far as it goes. I say this because the producers ran out of money and several of the scenes of the "Black" Scorpion's are obviously just "Black" mattes where the stop motion animation was to be inserted, but who care when you're involved with a good story and now 10 years of age? A "Black Scorpion" matte shot looking like a real "Black" Scorpion, because of the lack of funds. There was some complaining that the close ups of the main scorpion looked too much like a real person's face. Judge for yourself. Another complaint was that the train in the film was obviously a Lionel Train and the markings on the locomotive hadn't been hidden very well. Again who cared? Model trains were used in motion pictures since the silent era. 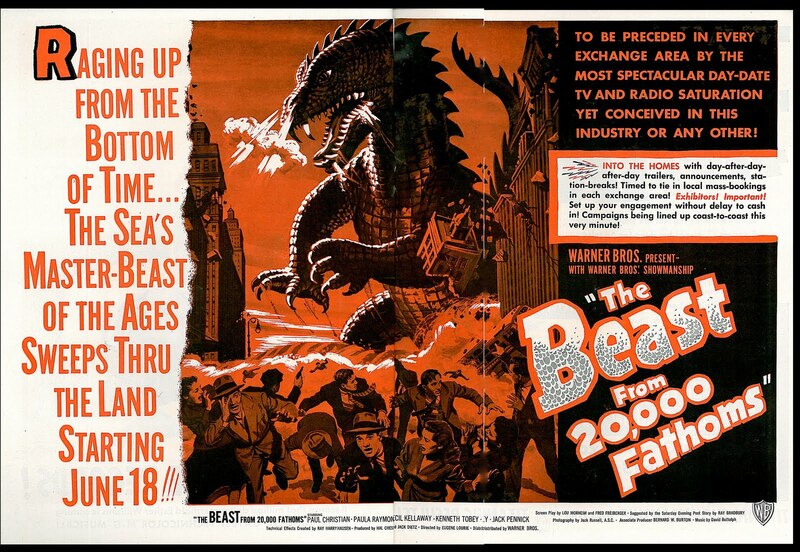 Willis O'Brien crossed the Atlantic to make a film very similar in aspects to Ray Harryhausen's 1953 "The Beast from 20,000 Fathoms". The reason was probably because both the 1953 motion picture and the 1959 were directed and co-written by Eugene Lourie. The movie was released in the United States as "The Giant Behemoth", but the original U.K. title was "Behemoth the Sea Monster". There are some interesting production aspects for this motion picture. To begin Eugene Lourie was supposed to have told the other script writers to watch "The Beast from 20,000 Fathoms" and basically copy it. 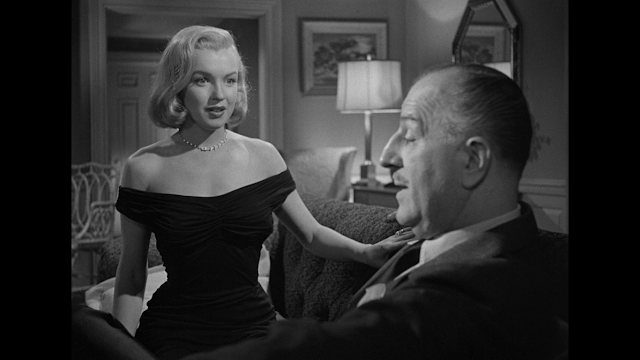 Some scenes are almost duplicated from the 1953 film. The Giant Behemoth in London. Lourie had known Willis O'Brien was available and suggested him to the producers for the special effects. Instead they hired Jack Rabin who immediately subcontracted the effects out to O'Brien for a flat fee of $5,000. Although the movie was shot in England the effects work were created in Los Angeles. and the actual work was not down by O'Brien, but his assistant Pete Peterson. Peterson had worked with Willis O'Brien and Ray Harryhausen on "Mighty Joe Young". This trailer includes a scene of the Behemoth smashing a car. That exact scene would be used three different times within the motion picture, There is also a sequence reminiscent of "Gojira" back in 1954 as the Behemoth approaches some electrical towers. In all fairness movies of this type almost always had the same type of action, but this film seemed to copy sequences right off other successful monster movies of the era as my next paragraph clearly illustrates. Although Eugene Lourie was not involved with the 1955 motion picture "It Came from Beneath the Sea". The sequence where Gene Evans finally kills the Behemoth using a mini-submarine is almost an exact copy of the same sequence of Kenneth Tobey killing Ray Harryhausen's six legged Octopus. As I have been mentioning "The Beast from 20,000 Fathoms" in this article. Here are three points about the film which my readers may not be aware about. The first is that during the films initial release. At selected theaters it was released with the sequences of the Beast tinted sepia as a poor man's color. Lead actor Paul Christian playing Professor Tom Nesbitt. Christian was really German actor Paul Hubschmid. His name was changed over the fear that a German actor as lead would keep 1953 American audiences away from the movie released so close to the end of World War 2. A fear that would stop any plans of a straight dub, or subtitled major release of the Japanese film "Gojira" the following year and result in the American re-edit "Godzilla, King of the Monsters" in 1956. 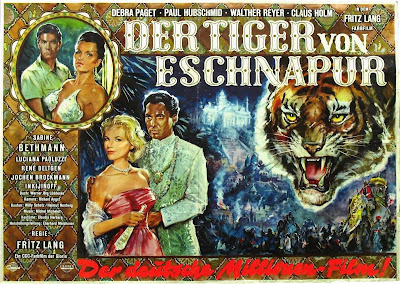 When American International Pictures edited Fritz Lang's "The Tiger of Eschnapur" and its second part "The Indian Tomb", which ran a total of 203 minutes, into the 94 minute "Journey to the Lost City". Once again Paul Hubschmid became Paul Christian. Kenneth Tobey who played Colonel Jack Evans also starred in Howard Hawks' "The Thing from Another World" and Ray Harryhausen's "It Came from Beneath the Sea". Of no real importance but earlier I mentioned going to the Sepulveda Drive-in to see Roger Corman's "Viking Women and the Sea Serpent". At that time Kenneth Tobey lived three houses from mine on Martha Street. The final project Willis O'Brien wanted to make was a screenplay he had written "King Kong vs Frankenstein", It was never made as he envisioned it, but read the short article on "Wikizilla" about the events surrounding the screenplay which includes some of O'Brien's original drawings for his purposed project. Drawings increasing the size of Kong. Willis O'Brien died on November 8, 1962 at the age of 76. The Toho production of "King Kong vs Godzilla" derived from O'Brien's original screenplay was released in its original Japanese version on August 11, 1962. The United States version by John Beck would not be released until June 3, 1963. O'Brien never saw the Japanese film before he passed away, but he did file a lawsuit which the Estate of Merian C. Cooper joined to fight the illegal use of the character "King Kong". It would also lead to a battle in the United States over who had the right to use that character. Five years before he produced "The Beast of Hollow Mountain" Edward Nassour was the animation supervisor without screen credit on the very low budgeted "The Lost Continent" from Robert L. Lippert. The movie starred Cesar Romero the first on screen Doc Holliday in 1939's "Frontier Marshall" and the first on screen "Joker" in the 1970's camp television show "Batman". Along with actors who would be tied to Science Fiction classics. They were Hillary (Hilary) Brooke who would become a foil for Abbott and Costello on their television series, but is remembered by Science Fiction fans as Jimmy Hunt's mother in the original 1953 "Invaders from Mars", Hugh Beaumont "The Mole People" and "The Human Duplicators", but who is best remembered as Ward Cleaver on television's "Leave It to Beaver", John Hoyt who would appear in George Pal's "When Worlds Collide" and the films "The Time Travelers" and "Voyage to the Bottom of the Sea", Whit Bissell who was in "The Creature from the Black Lagoon", George Pal's "The Time Machine" and played the evil scientist in both "I Was a Teenage Werewolf"and "I Was a Teenage Frankenstein". Lastly playing the Jungle Native Girl was the actress Acqanetta. She played another Jungle Native Girl named Paula. Who through a mad scientists serum is able to turn into an ape in both "Captive Wild Women" and its sequel"Jungle Women". A group of scientists and military personnel are sent to a small island to retrieve the vital equipment on a crashed rocket. What they discover is a plateau full of live dinosaurs at the site of the rocket crash. In short welcome to Sir Arthur Conan Doyle's "The Lost World" in an updated version with stop motion dinosaurs even below the level of Willis O'Brien's 1925 original. To make the film more eerie the producers had the scenes on the plateau tinted Green. Another trick from that original 1925 movie used by many silent films. These first two stills are from 1951's "The Lost Continent" with dinosaurs created by Edward Nassour and his team. These two stills are from 1925's "The Lost World" with dinosaurs created by Willis O'Brien. Green image is from "The Lost Continent" and the Red image is from"The Lost World". "The 8th Wonder of the World---FOUND"
26 years before Ray Harryhausen made "One Million Years B.C." produced by Hal Roach, Jr.. There was the Academy Award nominated special effects of Roy Seawright and Elmer Raguse in Hal Roach's 1940 film "One Million B.C.". The original black and white version starred Victor Mature, Doc Holliday in John Ford's "My Darling Clementine" and Samson in Cecil B. DeMille's "Samson and Deliiah" as Tumack. John Richardson would play the character in the 1966 movie. In the original version Carol Landis played Loana and in the remake Rachel Welch played the part. Playing the part of Tumak's father in the 1940 "One Million B.C." was Lon Chaney, Jr. While Robert Brown played the role in the 1966 remake. Except that the 1940 film has a group of modern day mountain climbers entering a cave to get out of the rain. Where they find a paleontologist who tells them the story from cave paintings as Mature and Landis become Tumak and Loana. The two movies stories are almost scene by scene the same with slight changes. The 1940 "One Million B.C." used real lizards and suitmation. While Ray Harryhausen wanted to use only stop motion animation for the 1966 "One Million Years B.C.". However, Hammer films to keep costs down and speed up production time had Harryhausen also use live lizards. 1940 original version of the story. The T-Rex is actually an actor in costume. For those of my readers who have never seen the original 1940 motion picture. This link will take you to it. There is a hypothesis going back to the 17th century that the Earth is "Hollow" and the entrances to this inner world are located at different points around the globe. Some of those today that still believe in this hypothesis add that the survivors of either Atlantis, MU, or Lemuria are to be found within this inner Earth. You may take your pick of any of those "Lost Continents" and insert the name of your choice. The Japanese movie studio Toho in 1996 released an excellent Anime entry titled "Super Atragon" in English. The original title is "Shin Kaitei Gunkan (The New Submarine Battleship), The story is about the survivors of the MU empire living in the "Hollow Earth". Since the start of the second World War they have been attempting to reclaim the Earth through their advance science. . The story retains some of the plot of the 1963 motion picture, but without the God Manda. In 1946 the United States Navy had an actual mission called "Operation Highjump" to explore Antarctica. In an area known as "Bunger Hills" a "Secret Lake" was discovered containing very warm water. In 1947 there was an expedition to led by Explorer Admiral Richard E. Byrd for the Navy to further explore the lake and its surrounding areas. According to those who believe in "The Hollow Earth" hypothesis. Byrd actually entered the inner world and recorded his discovery on film. These believers add that Byrd discovered living dinosaurs, but his records and film of this part of his expedition are of course part of a Government cover-up. The alleged Admiral Byrd findings formed the basis for 1957's "The Land Unknown". While investigating an area of Antarctica by helicopter. A small group of Navy and civilian scientists are called back to their ship, because of a massive storm that is developing over the area. Caught in the storm the helicopter is hit by a pterosaur and they are forced to attempt a landing. Going down they discover their altimeter is now reading below sea level as they continue descending into what may be an unknown volcano. When the sky clears these explorers are now in "The Hollow Earth" in a prehistoric land. 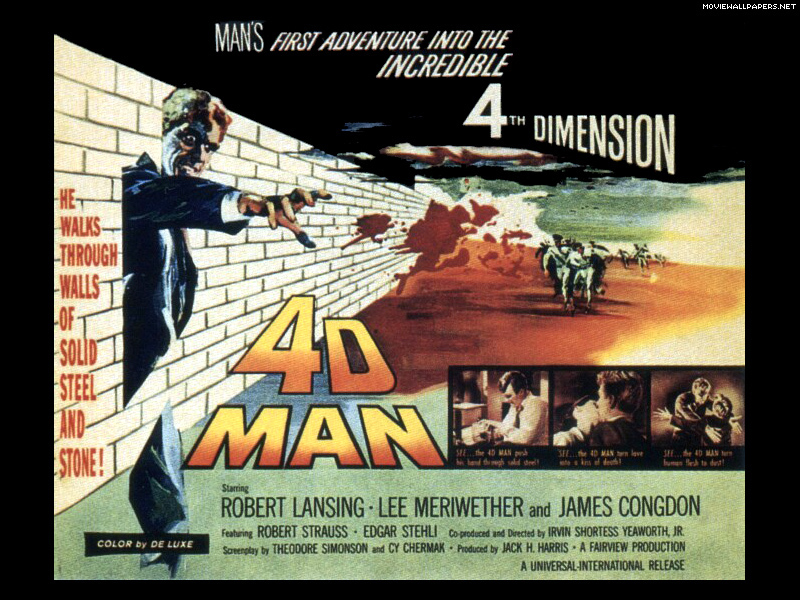 For Science Fiction fans the movie was produced by William Alland for Universal Studios. Alland also produced "It Came from Outer Space", "The Creature from the Black Lagoon", "This Island Earth", "The Deadly Mantis" and "The Colossus of New York" among other films and his own acting career that started with "Citizen Kane". The movie starred Jock Mahoney the Step Father of Sally Fields, but a stunt man turned Cowboy Actor. He would star in 1958's television show "Yancy Derringer". Among his other film roles was the villain in 1960's "Tarzan the Magnificent" starring Gordon Scott as Tarzan. In 1962 he starred in "Tarzan Goes to India" as Tarzan and a year later repeated the role in "Tarzan's Three Challenges". He made many guest appearances on Westerns and in 1981 was the "stunt coordinator" on the 1981 movie "Tarzan". Actor Tim Smyth is listed as "The Tyrannosaurus Rex" in the film's credit. Jock Mahoney and Shirley Patterson who appeared in "It the Terror from Beyond Space" the story idea for Ridley Scott's 1979 "Alien". Two pages from the Dell Comic Book of the motion picture. Dell made many comics from current movies during the 1950's and into the 1960's. Along with television programs. The press book page with available posters for the movie. Note the reference to the Byrd expedition. If ever there was a tired, synthetic, plodding sample of movie junk, it's this "epic" about two prehistoric animals hauled from an underwater deep-freeze by some island engineers. Obviously Thompson was not a 13 year old, or younger kid at the time. The film was silly and very low budget, but somehow it was also just fun. On a Caribbean Island an American company widening the harbor uncovers two dinosaurs frozen in suspended animation. Of course the two come alive along with a caveman. The caveman was used for comic relief. The stop motion is not the greatest as compared to either O'Brien, or Harryhausen, but for a movie aimed at a young audience it works. Infact the shots of the Brontosaurus was used on the classic "Twilight Zone" episode "The Odyssey of Flight 33". The best sequence is at the end when the T-Rex fights a mechanical digger. Once more here is a link to the complete motion picture. I started with Roger Corman and I will finish with a movie he claims he never made. Actually his male lead Robert Vaughn claims he never appeared in it either. As I have mentioned twice now James H. Nicholson believed in a poster that would capture a passerby's attention to his movie. Here is the one for "Teenage Caveman". Back to why Roger Corman and Robert Vaughn claim they never made this movie. The film they shot was called "Prehistoric World", but when Nicholson's AIP distributed it the title was changed to "Teenage Caveman". In the U.K. the movie was titled "Out of the Darkness" which based upon the screenplay was probably the best title. Although I did like "The Land of Prehistoric Women". The dinosaur, or shall we call it lizard scenes came from stock footage of 1940's "One Million B.C." and other films. The cavemen in the picture speak perfect English and are forbidden to cross a river, because of a law passed down warning of a ancient monster. So the side they live on is harsh and barren without much food sources. While the forbidden side of the river, which they can clearly see, is lush with plants, animals and fruit tress. One young caveman decides to cross into the forbidden side. The monster they are afraid of is shown in the color lobby card above. The angle of the shot makes it appear gigantic, but it turns out to be an old man in what was once a radiation protection suit. Apparently he has wandered the area for decades the last person who remembers the atomic holocaust that caused the human race to regress to a semi-caveman period. According to Robert Vaughn he considered this to be the worst motion picture ever made. He was 26 years old when he played the 'Teenage" lead. Also notice how his hair is perfecting cut and styled. At least the cavemen of this film were not neanderthals. I hope you have enjoyed reading this article about my favorite movies containing dinosaurs and sea serpents. Next month I will be 69 years old and looking back at these 25 motion pictures. Some made before I was even a teenager. I feel something has been lost with today's films of a similar nature. Even with the highly successful "Jurassic Park" series of films by Steven Spielberg and Peter Jackson's 2005 remake of "King Kong". I am not putting these films down in anyway, but the 25 I have mentioned had two elements that I believe CGI and the search for reality has lost. Perhaps that's because of our lack of knowledge as to what these animals really looked like when these films came out versus today. The fantasy aspect of each animal has been replaced with the reality of their true appearance. That doesn't sound like much, but I refer to the use of a persons imagination in both envisioning the creatures and in viewing them. A Willis O'Brien, or Ray Harryhausen had to decide what the creature would look like based upon known facts and come up with a representation from that limited information. Then the viewer had to take that stop motion creation and suspend in their mind the fact that they were only seeing a puppet representation. So that the animal became real in the viewers mind as the movie was watched. Watching "Jurassic Park" you know that what you are now seeing IS what the animal actually looks like. You do not have to use your sense of imagination to the degree as somebody did when these films were released, or suspend your sense of belief. The second missing element is in some respects a sense of wonder. When most of these films were made and released we hadn't been into outer space, or explored a lot of the Earth's area such as the Amazon. Even when Irwin Allen made his 1960 film of Sir Arthur Conan Doyle's 1912 novel "The Lost World". We were seeing these creatures seemingly alive and in an area yet unexplored and therefore their existence was not dis-proven. Which lent that sense of wonder the "What if factor", if you care to state it another way. A movie like "Jurassic Park" gives the viewer the science and takes away most of that "What if factor". So when you think of these films do not attempt to compare them with what can be made today, but put them into their real context with the world at the time they were made. 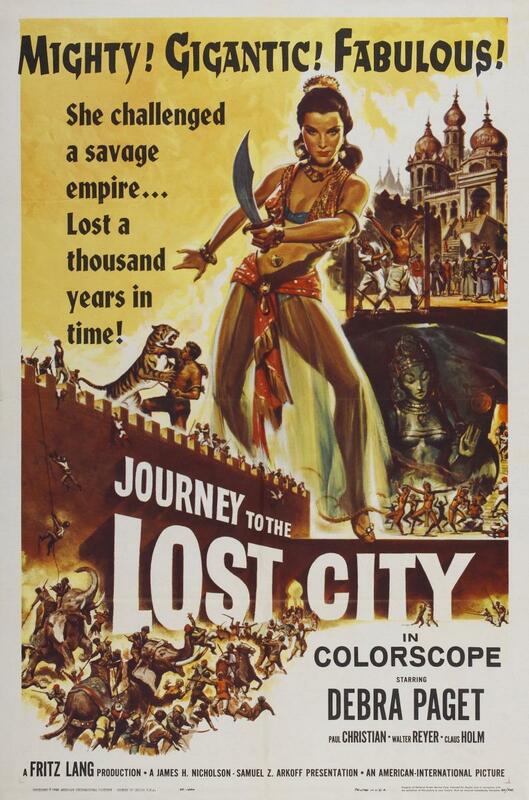 Then sit back and watch either the 1925 "The Lost World", or 1957's "The Land Unknown" with that added mindset.